In my opinion, digital photo printing is equal parts art and science. It covers much greater depth than can be contained within one blog post, so if that’s what you’re looking for, there are plenty of other resources on the ‘net. If you want an introduction to photography and colour management, you might want to start here: Photography and Colour Management. Okay, this is going to be a quick (for me) blog post. Assuming that you have some understanding of colour models, you know that while Lab is completely device independent, CMYK is completely device dependent (RGB is somewhere in the middle). As Vincent Versace has been known to say, printers are default devices: they only work with the information you send them. As such, the colour on a print relies on the printer and the inkset it contains, the paper chosen and the .icc profile for that paper. The printer profile is a set of instructions that translate the RGB colour space from your monitor into a CMYK colour space that your printer will recognize. Every printer/ paper combination has its own .icc profile, whether custom made for an individual machine or provided by the paper manufacturer for their stock. Now, while the only way to know 100% what your print will look like is to print it (known as hardproofing), one can get most of the way there by softproofing. This simulates (as much as possible) what the print will look like on your computer screen. Once you have an idea what the print will look like, you can modify the settings to make the print emulate what you want. Keep in mind that monitors are emissive devices (they project light) while paper reflects light. We enable softproofing by checking the box in the bottom tool tab (if you can’t see the bottom tab, press T). 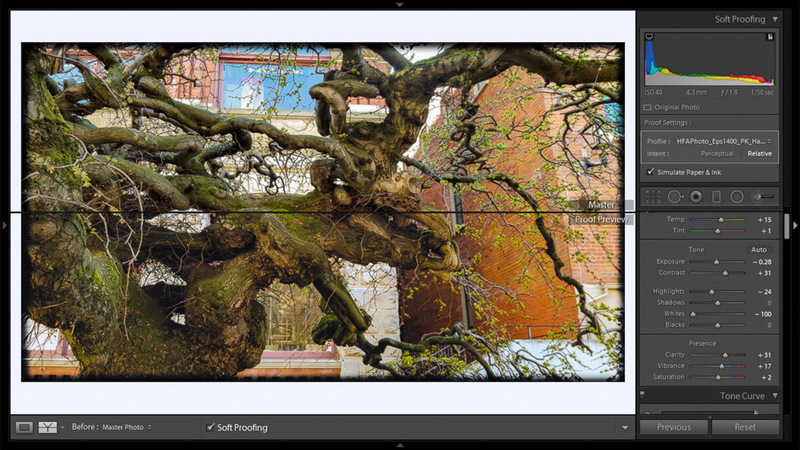 In the right panel you’ll see that the profile for Hahnemühle Photo Luster is selected, as is the Relative Colorimetric rendering intent and the ‘Simulate Paper and Ink’ box is checked. The latter is also known as the ‘make my print look ugly’ button. One can readily see that the white balance has changed, there is less saturation and the exposure as shifted. We want to modify this image to bring it back as close as possible to the one above, but we don’t want to change the adjustments we’ve already made. To that end, click on ‘Create Proof Copy’ in the right panel to create a virtual copy of this image with softproofing enabled. In order to compare this copy with our original image, we’re going to use the Before/After view option in the lower left of the bottom tab. The icon on the left shows one whole image, and the one beside it allows top/bottom, side-side or split-image views. This view option can be handy when processing an image as it allows us to compare where we are with where we were. In this case we’re going to compare the master image to this softproof virtual copy. 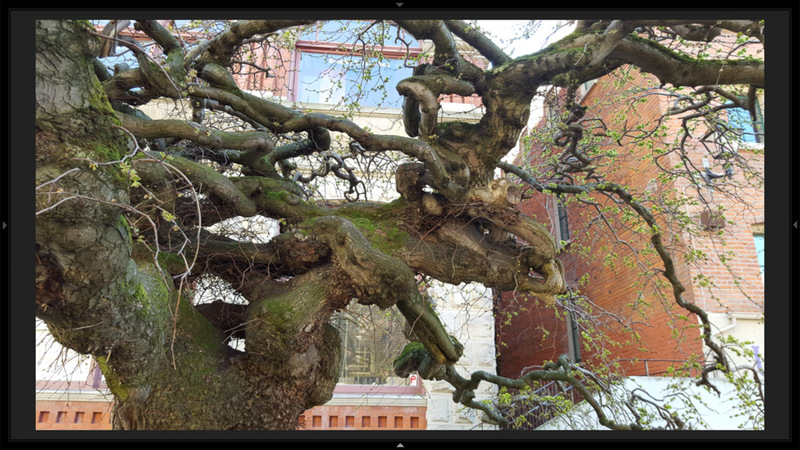 Using the top/ bottom view allows us to visually compare the two images. For this use, ensure that the ‘Before:’ image is set to Master Photo. As you can see from the image below, by adding some yellow to the colour temperature, increasing the saturation very slightly and lowering the exposure a little we’ve brought the softproof image very closely in line with the master image. Our softproofed image is now ready to head to the print module. P.S. 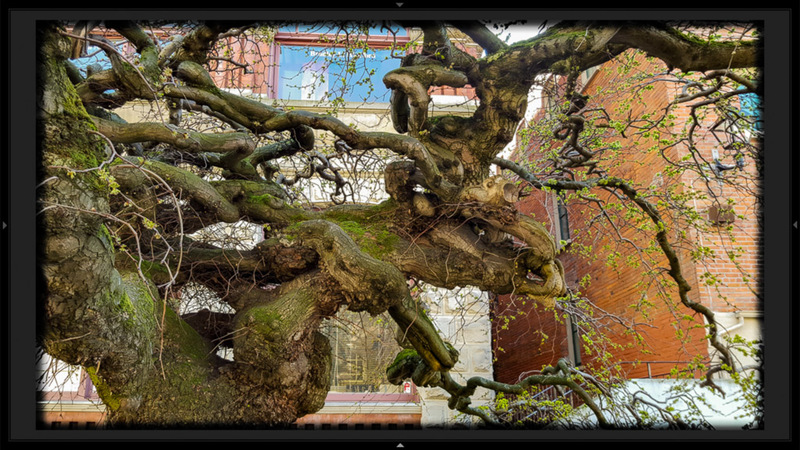 Another example where you might want to use Before/After view is if you have an image processed using an earlier version of Lightroom. If you open an image processed using Lr 2.x (for example) in Lr 6.x the image will have been processed using Process Version 2003. 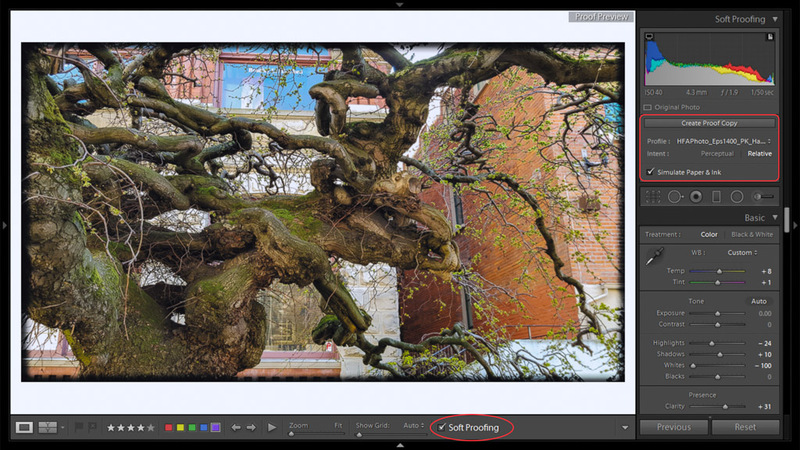 It can be left as it is without changes, but if you want to update it using the tools available in later versions of Lr (Process Version 2010 or 2012), you’ll have to convert it. Doing so will change the look of the image. 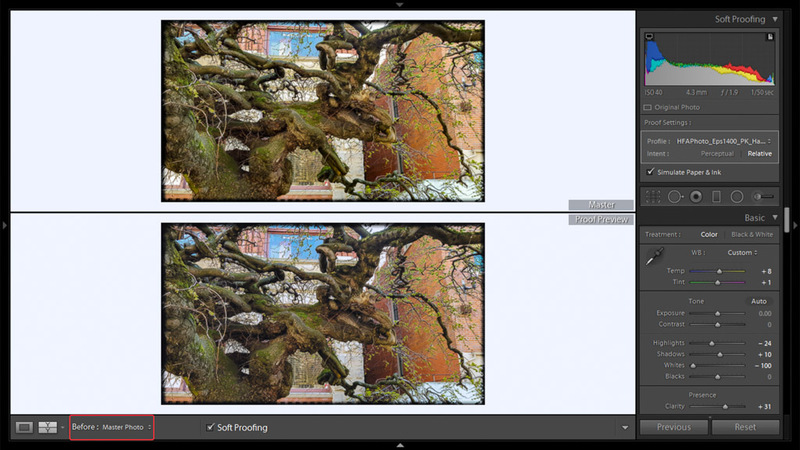 By using Before/After view you can use the sliders to bring back the image you had before. Or, if you prefer, you can simply make a new virtual copy, convert that to the new process version and create something entirely new! You did a great job on this post. I love how you explain the instructions. I found another alternative about this for that. I saw it on some when i search google too.. You can also check for that. I never thought that it would be a great effect on what you blog said. Thank you for sharing this! Keep it up!